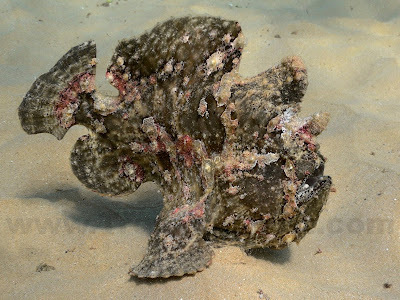 This morning was only the second time I've ever seen a Frogfish (that I've been aware of), and that was only because it was crossing a large stretch of sand. 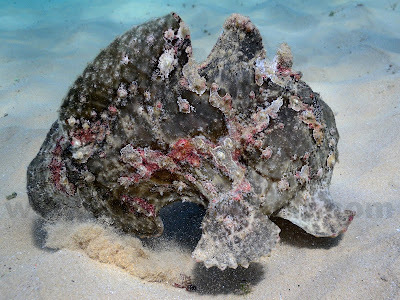 A frogfish's only defense is their incredible disguise; when one is among coral and rocks, they blend in perfectly. In the photo below look for the tail fin, the open mouth and the eye with a radial design. According to the Wikipedia article, they hunt by sucking in their prey and can swallow a fish which is twice their size (kind of reminds me of myself last Thanksgiving).